London Road Station - a heritage asset. Read why! Below are articles written by past and present Round Hill residents on the history of our neighbourhood. These articles and more can be found in past issues of 'The Round Hill Reporter' which can be downloaded (in PDF format) from here. where can each type be found in Round Hill? The Oliver Cromwell steam locomotive, running somewhat late, passed Round Hill in both directions (2pm and 2.15pm) on Sat 7th June leading at the front on its return journey eastwards. 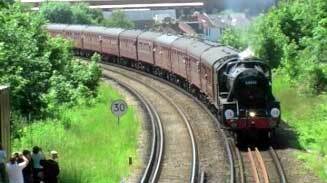 Another steam locotive, Black V, did the same, but running to time, on Sun 8th June 2014. These special excursions were to mark the 150th anniversary of the Brighton to Seaford line. Interactive Round Hill local history puzzles - TEST YOURSELF!